Mess tin and mess tin set, quality mess tins, British made mess tin as supplied to the MOD. 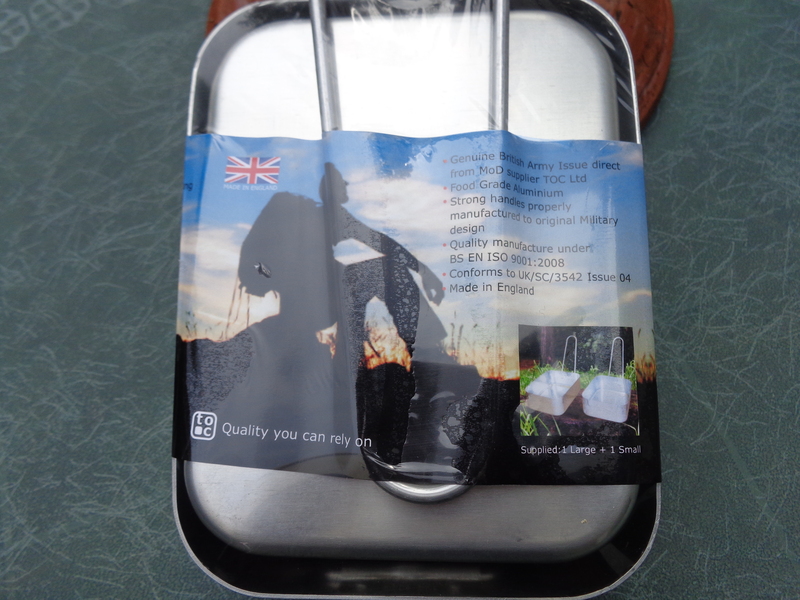 “These Mess Tins are manufactured by TOC (Tools of Coventry) Ltd. TOC Ltd supply products to the Ministry of Defence; they are reputedly the best and are often still recommended by expeditionary groups and outdoor people. There’s a great video review of mess tins generally below. Size: Large 60mm x 135mm x 180mm, Small 56mm x 128mm x 165mm. Supplied as a pair of tins, one nests inside the other. Handle: 5mm. Strong handles properly manufactured to original Military design. Care instructions; Wash in soapy water before use and after each use – dry thoroughly before storing. Used for cooking, boiling or to simply eat out of when camping, walking, trekking, and on expeditions; just like the military. “Still one of the best methods of cooking and eating”. . .these “Mess Tins are built for life not just for one trip …”. Brand new – made in Coventry, England. Genuine British Army issue direct from MOD supplier TOC Ltd. TOC Ltd is based in Coventry, England and has been supplying these mess tins and other equipment to the Ministry of Defence for over 30 years. Great value for money made in England mess tins. Genuine Britisg Army Mess Tin set. Made in England. Mess Tin Set. Made in England. Mess Tin set. Made in the UK. British made Mess Tin Set. Photograph by author. This entry was posted in Mess Tins, Outdoor Gear, Sports and tagged Army, British Army, British made mess tin, British made mess tins, Camping, Cooking, Genuine British Army Mess Tin, Great Outdoors, Made in England, Made in the UK mess tin, Mess Tin, Mess tin made in England, Mess tin set, Mess Tins, Military, Ministry of Defence, MOD, Outdoor cooking, Portable saucepan, tin, TOC Ltd, tocycle, UK made mess tins, www.messtin.co.uk on June 20, 2015 by ukmade.